I finally finished the FBB, well all but one handle to stitch on. I’m really quite chuffed and can’t believe it’s turned out so well, with no pattern to look at. I kind of thought the black handle/decrease part would look quite nice as there was a lot of pattern going on in the main part of the bag. The handles are black too, so it kind of pulled it together I think. My Mum has bought me the book, but I couldn’t wait that long, to see the pattern!! I’m starting a much larger version of this now, as it isn’t quite as big as the sort of bag I would normally buy, so this time, I’m using a cream aran mixed with a brown marble from James C Brett. Its still coming out quite striped, but I like it, and its lovely to work with too and its coming out massive, so I think a nice cream lining for that and some brown handles. I might even cover the handles with some leather type thong/thread slip knotted to cover. My Mums birthday is on Tuesday, So i decided I might try and make her something. I’ve been quite worried, as I’ve not been crocheting for long, and didn’t want to muck it up and she ends up with a crappy present. 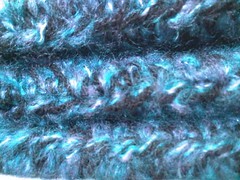 I started making a cushion cover on Tuesday and crocheted that in a really nice blue mohair mixed with a DK black I had. 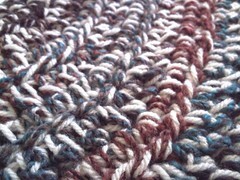 Its sooo soft and should be nice for her to cosy up with when shes sitting watching TV or knitting. I like the color of the bag. Looks good! I really like that – very nice!! 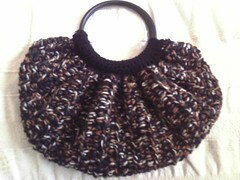 I love the bag,I myself love crocheted purses.But this one is wonderful. My question is how can I get a hold of the written pattern so I can make one for myself. I have never seen a pattern for it. Please can you help me???? ?